UBC Assistant Professor of Economics Ross Hickey explains why falling in love hurts the wallet more than the heart. Love—and the ring of cash registers—is in the air. Assistant professor of economics Ross Hickey, who teaches in the Irving K. Barber School of Arts and Sciences at UBC’s Okanagan campus, explains why falling in love hurts the wallet more than the heart. According to a survey by RetailMeNot.ca, the average Canadian plans to spend $164 on Valentine’s Day this year. Traditional romantic gifts still rank high in popularity. On average, consumers will spend $190 on jewellery, $76 on tickets to an event or show, $61 for lingerie, $40 on flowers and $18 for candy or chocolate. 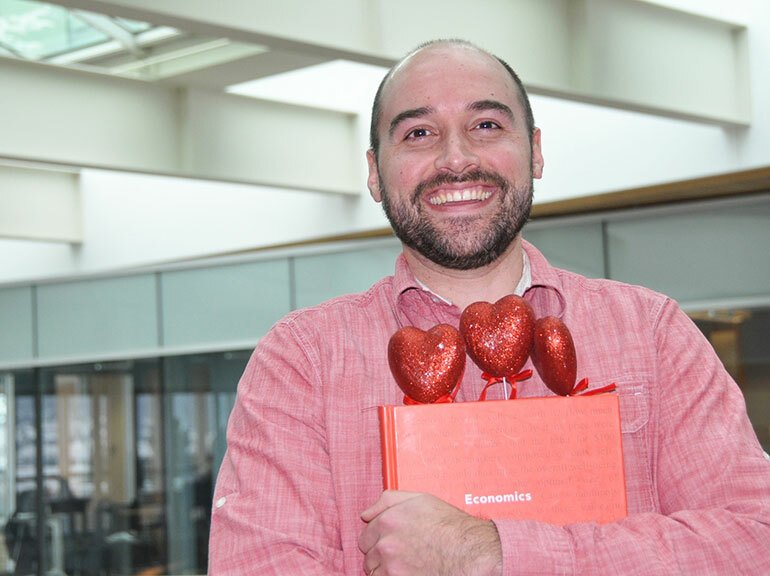 Whether you’re a cynic who thinks Valentine’s Day is just a holiday manufactured by the card, flower and jewellery industries, or whether you go all in with the hearts and chocolate, you might be interested to learn more about the economics of the annual holiday. Q: What economic factors explain the surge in prices on classic Valentine’s Day items such as flowers, chocolates and cards? Ross Hickey: This is the textbook lesson of supply and demand. All it takes is a big increase in demand to create a gap between what sellers can offer and what buyers want. Valentine’s Day creates a wedge between the amount of flowers demanded by buyers and the amount of flowers supplied by sellers. This excess demand means that the price gets pushed up, and up, and up until demand and supply are once again equal at the new price. It starts with flowers more so than other goods. Flowers need to be purchased on the day of, or at least within a day or two. Recognizing this, sellers can significantly increase the price because they know that’s when people are going to make the purchase, and it’s expected every February. Q: Can skipping Valentine’s Day cost more in the long run? Can it lead to breakups? RH: Studies have shown an increase in breakups prior to holidays like Christmas, and I imagine the same is taking place around Valentine’s Day, particularly for new couples. There is gift-giving pressure to make a material investment, and this pressure presents an opportunity to evaluate the relationship through a cost-benefit analysis. Holidays are particularly expensive, and the cost of participating depends on with whom you’re in love, coupled with their expectations, and whether or not you feel comfortable investing in that relationship. For new couples, the first Valentine’s Day is probably the hardest one. People in new relationships have a tendency to minimize their expectations for fear of being labelled as high maintenance, difficult or needy. As a result, both partners may have the incentive to understate their real expectations, and subsequently find themselves disappointed with their partner. Expectations are something you have to either meet or exceed. Q: Does social media impact the heightened pressure of Valentine’s Day? RH: Social media tools without question, make self-comparison more salient. Social media makes a lot of things more visible and in real time. Social media can add pressure to deliver even more on Valentine’s Day than in its absence. Imagine waking up on the west coast and logging onto Instagram, seeing east coast friends, family, retail companies and celebrities boasting about their Valentine’s Day celebrations. You see it, your partner will likely experience it too, and the effect of this may lead to engaging in more costly displays of affection, than what’s desired. Many economists actually argue it’s more valuable to receive cash as opposed to material goods or services, because there’s the probability of not purchasing the right gift. If, however, gift exchanges are valued over more than cash by the receiver, your gesture needs to indicate that you know what they like—this is what economists refer to as signalling game, as described by Nobel Prize award-winning economist Michael Spence. In the absence of these signals, your partner in theory would be happy with just a simple box of chocolates. But because of signalling and yes, social media, we are bombarded with images and experiences that heighten levels of expectations and as a result can impact what we actually do. Q: In an effort to spend less and beat the rush, what gifts do you recommend consumers purchase in advance of February 14th? RH: Chocolates and cards can be purchased in advance, because of their durability. What I would recommend as the better purchase is not necessarily the classic Valentine’s Day merchandise. Instead, you should invest in something that your significant other really enjoys, because those goods or services may not experience a surge in price. Remember, on Valentine’s Day, people are looking for gestures of affection. It’s the time of year when you signal to your partner that you know what his or her preferences are. Most importantly, don’t overthink it. In my experience, matters of the heart are best evaluated without an economists’ lens.